Transom and Frame: Heavy Duty welded aluminum. Deck: All aluminum knurled nonskid welded, epoxy treated. Gates: (4) including modified bow gate for trolling motor and 32 " wide wheelchair gate. Power: Yamaha 200 HP four-stroke engine with Minnkota Riptide I-Pilot electric trolling motor 70 lb. thrust 24 v.
Livewell: Moller 18"×27" round with an 800 GPH Rule pump, custom scoop and saltwater wash-down. Fuel Tank: 25 gallon welded aluminum. Helm: Tachometer, volt meter, fuel gauge, speedometer, horn, Hummingbird GPS depth-fishfinder, windshield, s/s grab rail, flush drink holder, enclosed Clarion stereo system with CD and 2 speakers. Batteries: 2 cranking, 2 deep cycle with Prosport built in battery charger, 2 Perko switches. 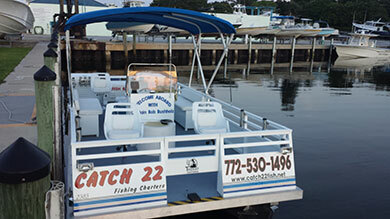 Seating: up to 8 people plus captain with 5 swivel seats and 2 bench seats all with cushions. Coolers: 3 total (1fish, 1 drink, 1 drybox) with custom supports. 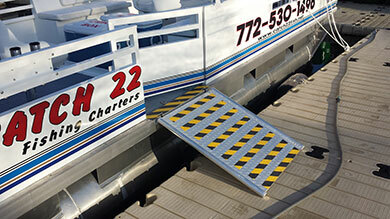 Other items include: 16 s/s rod holders with custom support brackets, 4 heavy duty deck cleats through-bolted with s/s hardware, zinc anodes, all running lights, fog lights, 2 bow mounted s/s folding drink holders, large folding Bimini top with boot, powder coated topside, 3' removable heavy duty wheelchair ramp and removable s/s folding dive ladder. 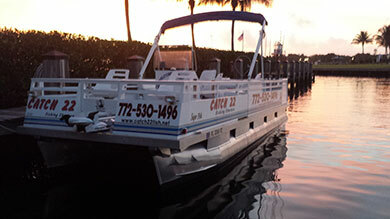 "This vessel is custom built to commercial U.S.C.G. standards and is truly built like a tank. 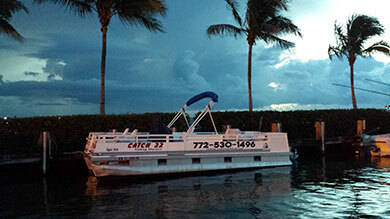 I have been professionally chartering with pontoon boats now for 22 years and can say there are no other pontoon boats out on the market today that comes close to Tridents structural integrity along with their smooth, stable and dry ride." Trident is located in Central Florida, just NW of Orlando in a town called Taveras. 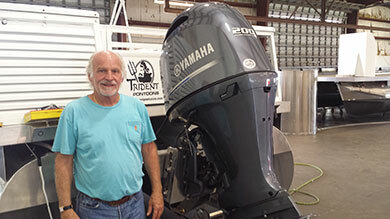 Trident manufacturers 12 standard vessels ranging from 25 to 65 feet in length but can also build custom smaller models on demand. 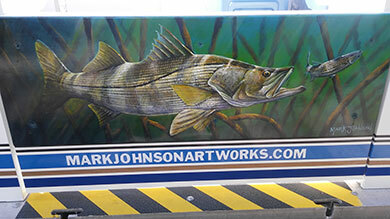 Original snook painting mounted on the starboard door. 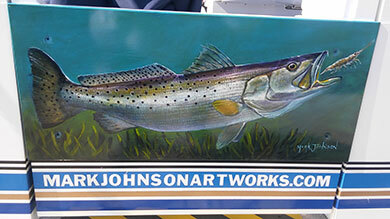 Original trout artwork mounted on the portside door. Mark Johnson was born and raised in Winter Garden, Florida. He began drawing at the age of 8 and was inspired by his love for the outdoors and fishing to preserve his vision of nature on canvas. As a fishing guide on the southwest coast of Florida and many years spent producing both skin mounts and replicas of fish, he became very familiar with his subject matter. 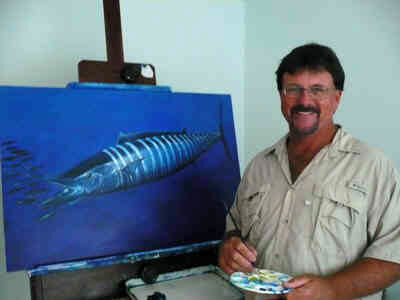 His paintings are realistic portrayals of Florida marine wildlife and landscape created primarily from his memory and imagination. Mark is self-taught and has been painting and exhibiting professionally since 1996. He prefers to sketch on canvas or masonite board after applying several coats of gesso, sanding in between each layer. Many admirers have stated how Mark is able to capture the “real-life essence” of whatever he paints.